Congrats to Karen Mundy winner of the second of 5 copies of Worldliness by C.J. Mahaney. I’m giving away another book today. Keep reading for details. Americans live in consumerism. Like the air we breathe, it surrounds us. Most of the time we don’t even realize it’s there. Most of us would never think we’re one of the millions who finds purpose, meaning, and order in material positions. But without even thinking about it we live in ways the demonstrate we believe our lives would be better with just a little more of this or a little bit better that. Here are 4 lies of consumerism. 1) My stuff makes me happy. Few people consciously believe stuff makes them happy, but… Consumerism says you’d be happier with a newer car that doesn’t break down as often. It says you’d be happier with a bigger house so the kids don’t have to share a room. Consumerism says it’d be nice to eat out on the weekends rather than cook. No not McDonalds, at least Chilis, or better yet, Bonefish. It says your kids need expensive birthday parties with Chuck E Cheese and inflatable, bouncy castles. It says you’d be happier with whiter teeth, shinier hair, fewer wrinkles, and tighter abs. 2) My stuff makes me important. Again, few people really believe this, but… Consumerism says you’ll feel important when your neighbors say they like your new sports car. It says you’ll feel good when your fiends ask you where you got that cute dress and those stylish shoes. Consumerism says you’ll feel important at the water cooler Monday morning when you’re telling everyone about your experience at the big game, out on the boat, at the 5 star hotel, or at the spa. 3) My stuff makes me secure. This one most people will acknowledge but rationalize because it seems so true and necessary. Consumerism says if you love your family you’ll buy life insurance and auto insurance and health insurance and long term disability. It says your anxiety would be a lot less if you moved out of the city into the suburbs… a nice suburb… gated… with 24 hour security. It says if you earn enough or save enough you’ll have less to worry about. 4) My stuff makes me rich. Consumerism says the rich people are the people with a lot of money – Bill Gates, Warren Buffet, movie stars, rock stars, sports stars. 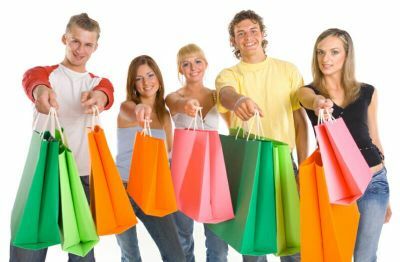 Consumerism ignores the infinitely better riches every Christian has stored up for them in heaven. It mocks the richness of the peace, hope, and love that comes from a relationship with God. Just to be clear, I’m not saying there’s anything inherently wrong with buying a new car, eating out, buying insurance or anything else mentioned above. They can be very good, and can help do what God has called us to do. The problem is when our first instinct is to look to money and stuff to solve our problems. It’s when we’re not happy with what we have. It’s when our hopes and dreams revolve stuff instead of God. The sin of covetousness is not that we have stuff; it’s that our stuff has us. In what ways does stuff have you? In what ways are you going to change your thinking or actions regarding stuff? Where have you found victory over consumerism in your life? Post a comment to this post. One person will be randomly selected the morning of Tuesday 3/2 to receive a free copy of Worldliness. If you don’t win today, don’t worry, there are 2 more posts yet to come. If you tweeted/shared/commented yesterday, yes, you need to tweet/share/comment today to have a chance to win the book today. Worldliness: Where is Your Media & Music Taking You?